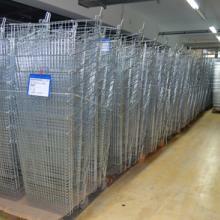 A s far as the eye can see: steel baskets waiting for final assembly in the huge production hall. Ready to be moved with the help of polyurethane timing belts. 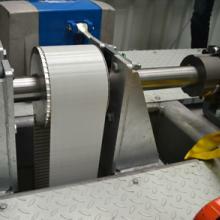 BRECO® ATS 15 polyurethane timing belts move steel baskets on pallets in vertical conveyors 11 metres up. These high performance timing belts reliably move up to 2 tonnes to a precise position up to 50 times an hour. Shopping trolleys are pushed or pulled throughout the world. They are so useful for shopping that you can hardly do without them. They can carry up to 200 kg and withstand collisions. Most of the shopping trolleys made throughout the world are manufactured in Leipheim, a small town situated between Ulm and Augsburg, near the Autobahn 8. Each year, more than 1 million shopping trolleys leave the production plant of the market leader Wanzl. With such a high throughput of steel rods and baskets, the transport of the baskets between the individual manufacturing steps presents a logistic challenge. View from the roller conveyor to the lift cage and the two lateral timing belt drives. Production areas are expensive and development sites limited, therefore production lines often have to be arranged over several floors, requiring special transport solutions. There are proven solutions for Euro-pallets on the market. Due to the large range of products at Wanzl, diverse dimensions of the containers and different pallet types, Wanzl was not able to use a standard solution. So a special solution had to be found. Technikmanufaktur Augenstein, specialising in bespoke machines, is located less than 5 km from the Wanzl head office. Augenstein has been supplying the food, electrical, pharmaceutical and automotive industries with solutions for conveying, lifting, packing, filling, feeding and transporting for more than 30 years. 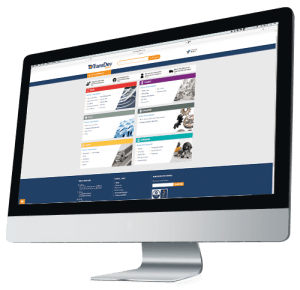 The list of products and custom-designed special machines is very long: Transport and distribution systems for cups, belt conveyors, box transport systems, gripper conveyors, pick-and-place machines, girth welders, infeed starwheels and infeed screws for the food industry, pallet control stations, pallet transport systems, chain conveyors, corner transfer units, palletizers, elevators, vertical conveyors etc. Reinhold Michl, field sales representative and applications engineer at Roth Ingenieurtechnik from Nuremberg (on the left), and Norbert Zachmann, project manager at Technikmanufaktur Augenstein, shortly before the vertical conveyor at Wanzl was put into operation. Jörg Deiters, Managing Director at Augenstein, thinks back: “At the beginning of 2014 we received an enquiry for two vertical conveyors including the necessary roller conveyors for infeed, discharge and further transport, and for control and safety technology.” The technical requirements are demanding: The load, weighing up to 2 tonnes including the lift cage, has to be raised by more than 11 metres. In the case of the roller conveyor, an overall height of only 155 mm was required and the system had to be able to transport Euro-pallets, industrial pallets and wire mesh boxes. It was also necessary to take overhangs of the outer contour of the pallets into consideration. “We were eventually awarded the contract, and designed a pallet detection and contour detection system using light grids, an infeed and discharge station, the access control system, the entire transport technology for all pallet sizes and the vertical conveyors,” project manager Norbert Zachmann adds. In addition, rapid action doors were installed in the individual storeys as anti-fall guards. They also suppress the draft in the walled-in vertical conveyor. The employee drives with the pallet truck behind the access control system of the recently completed machine line up to the stop, deposits the pallet or wire mesh box onto the roller conveyor, drives out, operates the access control system and specifies which floor the item is to be taken to. As soon as the control system has given the traverse command, the item to be transported moves through the contour check and the rapid action doors into the lift cage of the vertical conveyor. This then transports the container to the preselected floor. A light grid in the vertical conveyor provides additional safety by signalling a malfunction if material falls from the container. The order of the traverse tasks entered into the terminal is decided by the control system. 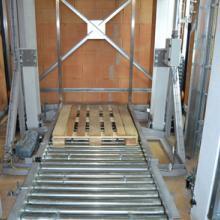 Up to 50 pallet movements per hour are possible. The geared servo motor distributes its torque via steel multiple-disc clutches to the pulleys. During the design stage, Augenstein contacted its drive systems supplier Roth Ingenieurtechnik from Nuremberg to test the use of low-maintenance polyurethane timing belts. Reinhold Michl, the field sales engineer at Roth assigned with the task, designed the timing belt drives, to be arranged in parallel, for a load of 2.2 tonnes and a start-up acceleration of 0.25 m/s2. The selected polyurethane timing belts BRECO® ATS 15 in a width of 150 mm carry the weight without any problem. The operating ratios for the tooth shear strength and tensile load are adequately dimensioned. 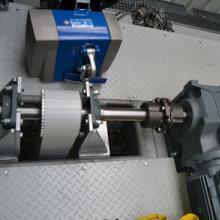 Many suppliers position the motor of a lifting drive at the bottom because fastening and wiring is easier. However, if this requires a pit, it considerably increases construction costs. Augenstein positioned the drive motors of its vertical conveyors at the top. The pulleys with a diameter of 230 mm run in solid housing bearings. The bottom pulleys are designed for diverting the belts and are non-toothed. A high modulus timing belt, specified as elasticity, is particularly important in this context. In catalogues it is normally specified in N. The correct unit is [N/m] (m belt length). The specific elasticity specifies the force required to stretch a 1 m belt by 1 m.
BRECO®-fix: The polyurethane timing belt is connected to the lift cage with these clamping elements from the BRECO® range. The BRECO® ATS 15 polyurethane belt with a width of 150 mm, used in the vertical conveyor, has a specific elasticity of 1.03 x 107 N. This means that a load of 10150 N (approx. load of 1015 kg) is required to stretch the belt by 1 mm. This peak value is achieved by the high-strength tension members that have a diameter of 1.6 mm. 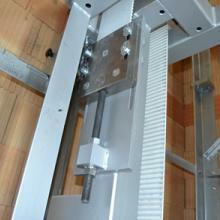 A high pitch accuracy and equal belt length guarantee precise transport to precise positions. The vertical conveyor designed by Augenstein allows companies to speed up the flow of materials and make better use of the space in their factories on all floors. The automated detection of pallet type, overhangs and dimensions leads to considerably higher flexibility of production. The capacity limits of the timing belts have not yet been reached with a weight of 2 tonnes and accelerations of 0.25 m/s2. TransDev can supply a range of BRECO solutions including customisation of belt lengths, backings and profiles. Learn more here.